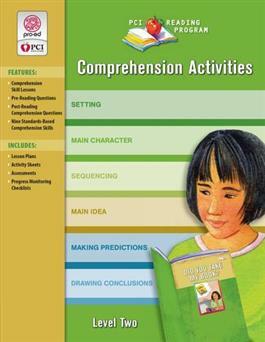 Extend and assess comprehension on the program's books with these fully scripted lessons and reproducible activities. For each book in the core program, these binders provide a reading comprehension lesson with activities for both pre- and post-reading. Comprehension lessons focus on standards-based literacy skills and strategies. Offers post-reading comprehension questions for each page in the books that reinforce these skills and strategies. Four reproducible activities are provided for each book along with a reproducible assessment. Progress monitoring checklists are included. Level Two Comprehension Activities binder (100 pp.) covers all 14 Level Two books. In addition to reviewing the skills taught in Level one, new skills such as summarization, cause and effect, and compare/contrast are introduced.